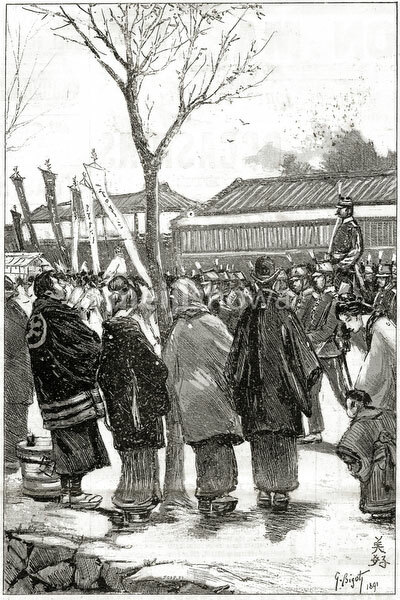 State funeral of Prince Sanjo Sanetomi (三条実美, 1837–1891), an Imperial court noble and statesman, in Tokyo. His grave is at Gokoku-ji (護国寺) in Bunkyo, Tokyo. Published in the French illustrated weekly Le Monde Illustré on June 6, 1891 (Meiji 24). Art by French artist Georges Ferdinand Bigot (1860-1927), famous for his satirical cartoons of life in Meiji period Japan.